-Try to work with cloths in both hands.You can achieve this in a few times but it`s efficiency is great. -If your walls are washable, we can advice you to start from bottom to the top.In this way you will avoid seeping the dirt. -Using a no foaming agents is always preferable. -Open boxes and packs with cleaning products which can be spilled only at the sink to avoid any additional cleaning of the spillage. -If you drop some food or drinks on the carpet(rug) put some backing soda or Soda Water to prevent unremovable mark. -Use all the equipment and tools in the most safety way. Do not use any ladders that are unsecured,steps or chairs.And the slightest negligence can cost you more. – Keep an eye on the innovations.Sometimes the technology can offer you a products that can save your time and to make your cleaning more pleasant. 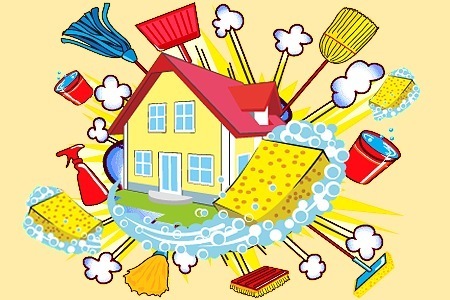 We`ll be very happy if we can some of your experienced tricks for easy and efficiently cleaning.